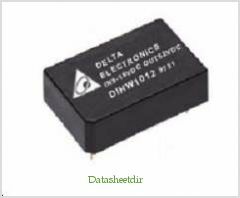 The Delphi DIHW1000, 5, 12, 24, 48V input, single or dual output, DIP form factor, isolated DC/DC converter is the latest offering from a world leader in power systems technology and manufacturing ― Delta Electronics, Inc. The DIHW1000 series operate from 5V, 12V, 24V, or 48V (2:1) and provides 5V, 12V or 24V of single output and ±12V or ±15V of dual output in an industrial standard, plastic case encapsulated DIP package. This series provides up to 3W of output power with 5600Vdc isolation and a typical full-load efficiency up to 84%. With creative design technology and optimization of component placement, these converters possess outstanding electrical and thermal performance, as well as extremely high reliability under highly stressful operating conditions. By Delta Electronics, Inc. This is one package pinout of DIHW1002,If you need more pinouts please download DIHW1002's pdf datasheet. 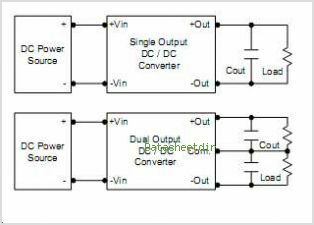 This is one application circuit of DIHW1002,If you need more circuits,please download DIHW1002's pdf datasheet.